Are content owners adding in social buttons because they provide value to their users? Or are they just taking up space and virtually ignored? I do have buttons on my posts but when it comes to submitting to them i have a long list of 104 bookmarking websites that i use. I do whatever is easiest. If there are links or icons, I use those. I’ll also use browser plugins (like for StumbleUpon, Delicious, and Searchles) and bookmarklets (like for Small Business Brief). When all else fails, I’ll go straight to the site. There are so many SB sites in the space now and more than half have only tiny amounts of traffic, so I only post to most of the big ones.,..and a few of the small ones that are easy to use. The BuzzMarker.com HOT 25 ranks the top social bookmark sites and also puts them into categories by type – news, bookmark only, specialty/shopping, etc – so you don’t end up bookmarking an SEO post to the shopping list site Kaboodle! Their July ranking are due out soon. I don’t interact with them yet. I am trying to figure that out. 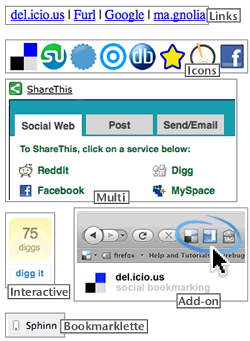 I just added the del.icio.us toolbar to my browser. In fact, I think right now I am a little afraid to add things so as not be spammed or open on the internet to the world. do you think this fear is something that is common? I’m with Kari… what ever is easiest is the option I’ll choose. It is most likely only useful to bookmark on major sites and for those, I have a browser add on. It is in our nature to ignore the icons and go with what we normally do but for the average person the icons may prove to be a valuable tool. I don’t know why but I never use social bookmark services, I think they are good for webmasters to spread the word about their services though. I am on the same page as Kari and Kathy. Which ever is easiest I use but mostly use browser addons. Thanks for the great poll very interesting results! Don’t be afraid to use the social bookmarking – you’re not opening yourself up to any spam on the internet. Social bookmarking sites have you create a username, so the worst that could happen is that other users can see what you’ve bookmarked – but that’s a good thing! It helps word of mouth about great new sites, tools and helpful information. If you’ve bookmarked a site that you find really interesting, you can see other users that have bookmarked that same page or site, and you may find they have resources or other articles you could benefit from. Give it a try – I have been using Delicious for a couple of years now and it is extremely convenient for saving information and referencing it at a later date. I tend use whatever is easiest, although I mostly use browser add-ons. I also go and vote at the actual site sometimes, especially on Sphinn and other niche-type social sites. So, I guess my opinion would be that they are “taking up space and virtually ignored” or possibly beginning to have a negative impact. I agree I use whatever option is easiest. But my favorite is the icons on the page or below the post. The easiest option, but badges work well below the post. After a lot of experimentation, I pretty much only use StumbleUpon and BizSugar. Both are on my browser toolbar (although BizSugar’s is just a bookmarklet on my links bar), so I really don’t need the extra buttons. However, I occasionally look that the buttons to see if there is anything new. I’ve only one button on actu-ecologie.fr which is the Jamespot one because it makes people thinking about what it is and I want them to spot my articles there more than in a simple digg-like. Several good points were made here. I also use the easiest option, which may vary according to the context of the page.